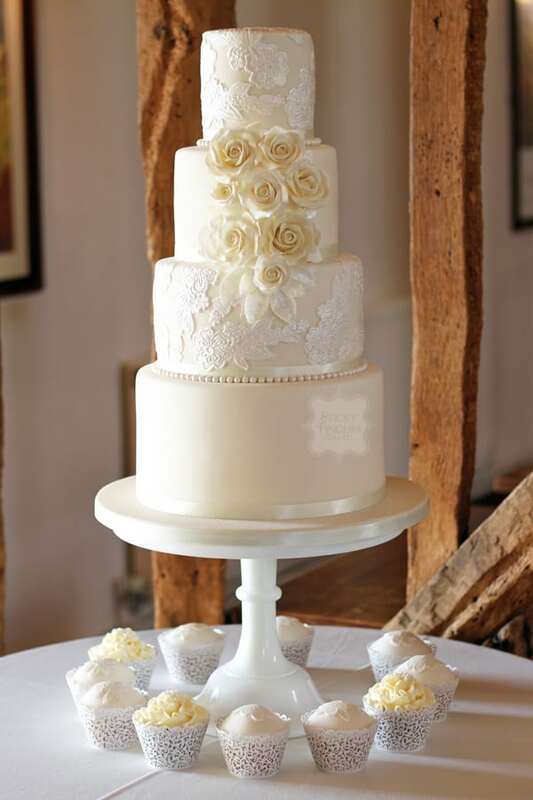 Our very first wedding cake set up in the beautiful Crondon Park, Stock – just outside Billericay, Essex. Such a gorgeous venue! Wendy and Kevin had ordered their wedding cake from us over eighteen months previously so it was lovely finally creating their stunning four tier ivory wedding cake, decorated in sugar lace, pearls and a large cluster of ivory sugar roses. It looked so elegant displayed on our large white Mosser cake stand, especially with the cute cupcakes they had ordered placed underneath too! Their yummy flavours were Lemon, Black Forest and Cookies and Cream for the main cake, with White Chocolate & Lemon and Gluten Free Dark Chocolate cupcakes. Wishing you massive congratulations and lifetime of happiness!